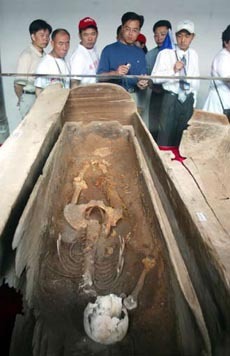 Hanging coffin is a unique funeral and sacrifice custom of the minority groups in southern China. 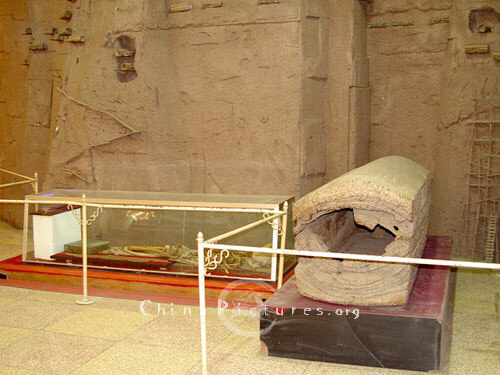 People put the bodies of their ancestors into wooden coffins that were later placed in caves of precipitous cliffsides. Archeologists believe that the coffins were placed on the cliff faces in this manner so that they were closer to the heavens. 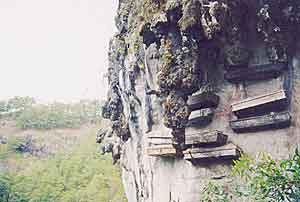 Coffins were either placed in caves in the cliffs or suspended on pegs. A stairs was constructed up the cliff face so that the coffins could be placed up high. Where do you find this stuff?? you are you a member in the National Geographic Society? admit it..you really are!! people who walk on all four..hanging coffins..its not you're usual news items..you have to go places to find those! synical: so how much would a coffin with a view cost? ocean view? mountain view? and last but not least..how do they get them up there? find out in next week's episode of Tulip's wonderful world of crazy stuff! People have one thing in common they are oll different. There was a study that talked about space burial. And that in the future almost everyone will be there, since it preserves the body from decay ...etc ..etc ..etc... And it would provide front raw seats to the end of days, and probably bring the body closer to it's maker! tab efredo wa7ad menhom bedo yroo7 yeshrab mai...walla ma2lab !! weird..bas bekono endafano bel ard we 3awamel el ta3reya 3emlat heek..maho men zaman 2a3deen !! Tulip's wonderful world of crazy stuff, hmmm sounds a good idea for a new header LOL. space burial? LOL, it must be the chinese idea bcuz this will definitely bring the bodies closer to their creator according to them. meen elle yeshrab may? the dead? and last but not least..how do they get them up there? find out in next week's episode of Tulip's wonderful world of crazy stuff! Hmm . . . interesting! I've read about Chinese Foot Binding. But not this. I've put in on my Blog too. You'd read it. Maqsood, sure I will check your blog and the post you mentioned. I like weird stuff.